I’ve kind of accidentally become a quasi-minimalist over the past couple years. I’m sure I’m not a “real” minimalist because, let’s be honest, sometimes often almost always, my house looks like this. So I guess I’m minimalist in the sense that I’ve come around to the somewhat old fashioned idea that less is more. I tossed a lot of things I’d been saving for some-day. I got rid of clothes I didn’t wear anymore. I cut the kids’ current sized clothes in half and stopped storing massive totes of old kids clothes. I donated the toys they don’t play with. I stopped letting paper pile up. And most importantly, I changed the way I think about buying. All this minimalist rambling is probably for a post, but it does affect how I think about Christmas gifts for our kiddos. BECAUSE I’m somewhat minimalist when it comes to kids’ toys we keep around the house. Partly because we don’t have any dedicated toy room, and there are 5 of us in a 970 sq. ft. 3 bedroom house. But also because I noticed that my 2 and 3 year old seem to entertain themselves better with less stuff around. We are also big on experiences & simple Christmas gifts for our kids. We recognize that giving and receiving is fun, but there’s an ever-present tension to making Christmas more about the gifts than the Giver. Honestly, there’s times I’m tempted to cut out the gifts tradition all-together. Instead, though, we’ve tried to keep gifts low key and include our kids in giving to other family and friends and in being generous to people we can help. I’ve been reading and hearing lots of great ideas for keeping Christmas simple, fun, and meaningful. I want to share a few with you today! I originally had this section at the end, but moved it to the beginning. Because if you don’t read ANY of the other ideas in this post, this one is the most important. The more time you spend in the Word, the more your heart, mind and soul will be fixated on the Creator. The Word who became flesh and dwelt among us. He is the reason Christmas exists. He is Love. He’s the sources of all lasting hope, joy, and peace. He’s the reason we give generously to those we love and those we don’t know. He reminds us that life isn’t about us, that it’s about spreading His love and seeking His kingdom here on earth. And no one can keep all that in the forefront of their minds without frequent renewing-of-the-mind in scripture. Read a chapter a day in the gospels, or read them chronologically throughout the month. Or read the Jesus Storybook Bible, where every story points to the coming King- who was and is and is to come. Listen to music that creates an atmopshere of worship in your home as you shift and re-shift your focus. Now THAT is a much-needed reminder this Christmas. Some fun ideas I’ve heard from friends and family for big gifts are: a new bike or lego set your kid has really wanted. Or a piano you got free off craigslist for a kid who wants to start lessons. Or the lessons themselves. Or ski lessons. Some stocking ideas – chapstick, gum, treats, socks, pjs, character tees, pens, notebooks, figurines, matchbox cars, stickers, crayons, coloring books, mini lego sets, books, movies, etc… The idea is a few small things that all come in one bag/ stocking & one big thing. As the kids get older, it’d be fun to have them participate in coming up with the gifts for parents too. I read this idea on this blog and really like it. It’s pretty self explanatory. * Get them something they want – for my 3 year old, this is a scooter. * Something they need – lunch box, backpack, school workbook, socks, phone cord, earbuds, gas gift card, date gift card, pens and pencils. * Something to wear – Shoes, fun socks, twirly dress, new pjs, clothes gift card for older kids who want to pick out their own clothes. * Something to read – Here’s a list of my favorite books for 1, 2, and 3 year olds. I like this idea for adults in your life too. If your budget is on the small side, you could have all the adult kids go in on the whole gift “package” together and get one thing in each category for the parents of your clan. Our kids decorate a plain calendar on December 1. They’re very gifted at art, as you can see. Emma got bored with paper and started decorating herself. You can read more about the rest of our basic Advent tradition with the kids here. This year, my go-to gifts are chatbooks, these minnetoka slipper-shoes, and my favorite Christmas CD, which is really easy to gift on itunes. 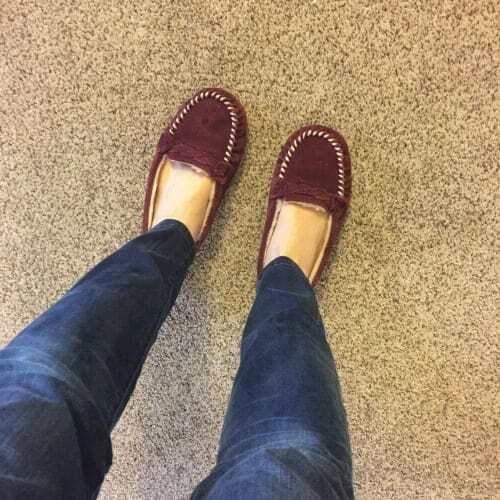 I found the slippers for $25 at Marshalls and wear them EVERY day around the house. I strongly prefer slippers like this over socks. Is that weird? Anyway, getting everyone the same thing makes gifting easy. Come up with a few favorite things for the year and just give them to everyone! This isn’t meant to minimize the thoughtfulness of giving specific gifts. If you have a specific idea for someone based on what they love, go for it! I ran into Marshall’s to grab a few gifts the other day becasue I had some store credit, and knew they’d have it all in one spot at a discounted price. But holy marketing batman. There is crap everywhere! Special tables and endcaps. Giant signs: “perfect gifts under $20 and $50 and $100!” Cards and wrapping paper and stocking stuffers everywhere in the checkout line. It’s just visually a LOT. And it’s all strategically designed to make you buy more. Buying stuff isn’t inherently bad. And giving is great. But it’s way easier to get sucked into the lie that you need to BUY MORE TO MAKE EVERYONE HAPPY when you go into the stores compared to online. If you get email notifications on your phone (which I turned off a year ago – best decision ever), your phone will likely be blowing up with sales emails left and right this time of year. Just shut it down friends. Unsubscribe from all of them. I re-unsubscribed from a lot this week and it was awesome. I usually also run to Target for stocking stuffers and to Marshall’s for a few random items. Stick to your list. Keep it simple, people! You can do it! While getting out of debt, Ben and I have skipped gifts for a lot of birthdays, mother’s days, father’s days, and christmases the past couple years. We’ve decided to still give to other people, but we just skip our own. And honestly, it’s fine! The day goes by, we still do something to say, “I love you,” but it’s just not gift-related. Sometimes we’ll grab the other person’s favorite candy or fresh flowers. Always a card with a thoughtful note. We use that month’s date budget to celebrate together. The more years we’ve done occasions like this, the less we miss the big gift anticipation. I’m not sure what we’ll do when we’re out of debt, but that’s what works for us right now. simplifying parties and meals and wrapping and white elephants. And making gatherings more about people and less about gifts. But I won’t. There are already WAY TOO MANY WORDS in this post. Do you have any ideas for keeping the holidays simple? Comment below!